Spiced Cookies come in lots of shapes and styles. 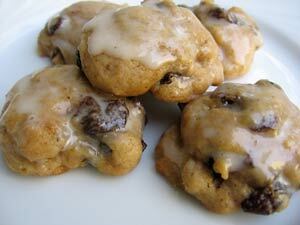 If you are looking for a recipe for soft Spice Drop Cookies, I hope you will give this one a try. This recipe has been a favorite since I discovered it several years ago while flipping through the delightful book, Once Upon a Tart . These soft spiced cookies are full of raisins and topped with a simple sugar icing - you may want to bake a batch soon and give them a try. Anytime during the holiday season this is the perfect spice cookies recipe. For me it's a quintessential Christmas cookie, so I only bake them in December! I like to use eggnog instead of light cream in the icing for a little extra touch of Christmas. Although not absolutely necessary, I think this dough works best when allowed to chill for an hour or so before baking. In a medium-size mixing bowl stir the flour, baking powder, spices, and salt together with a whisk until well blended then set aside. In a small bowl stir the sour cream and milk together with a whisk until well blended and set aside. In a large bowl beat the butter and sugar together with an electric mixer on medium high speed until really light and fluffy. (This should take about 4 to 5 minutes.) Scrape down the sides of the bowl with a rubber spatula to insure everything is well blended. Beat the eggs in one at a time with the mixer on low speed. Add the sour cream mixture and beat on low speed until well blended, scraping down the sides of the bowl as necessary. Gradually stir in the flour mixture, just until incorporated and then stir in the raisins. You can do this either with the electric mixer on low speed or with a large wooden spoon. Cover the dough with plastic wrap and refrigerate it until chilled, at least one hour. When you are ready to bake the cookies, position one of your oven racks in the center of the oven and preheat your oven to 350F degrees. Line your baking sheets with parchment paper, nonstick foil, or silicone liners. Alternatively lightly spray your baking sheets with nonstick cooking spray. Drop the cookie dough by teaspoonfuls onto the prepared baking sheets about 2 inches apart. Bake the cookies on the center rack of the oven for 10 to 12 minutes, or until the cookies are puffed, light golden brown, and no longer look wet. Once the cookies have cooled, in a small bowl combine the cream or eggnog and confectioner's sugar with a whisk until smooth. Use a pastry brush or back of a spoon to ice the top of each cookie. Once the icing is dry, store the cookies in an airtight container, separating each layer with wax paper so they don't stick together. Recipe source: This cookie recipe is adapted from the wonderful cookbook Once Upon A Tart by Frank Mentesana and Jerome Audureau.